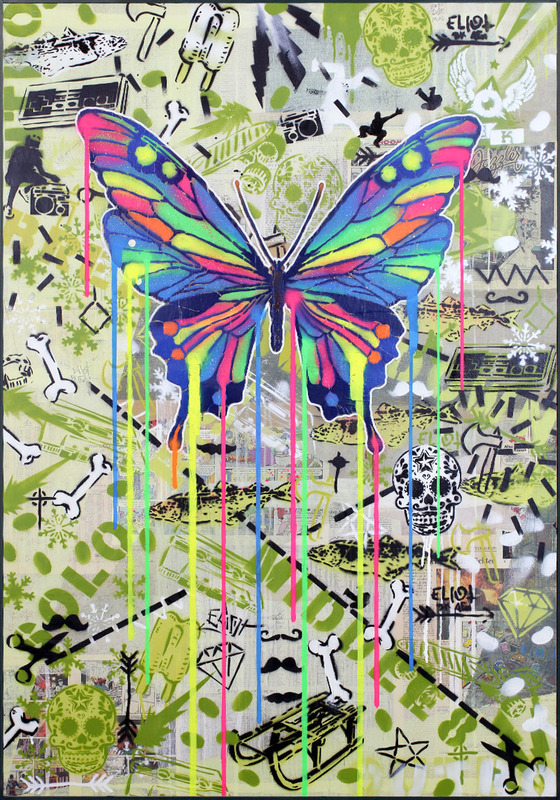 In the style of the Neon Soup Can I created this very flashy Butterfly. This is as well the first time using Insects and not food. The size is a 130 x 80 cm Wood panel. On this I pasted a collage of newspaper articles and comic books. I overpaint this background with acrylics and geometrical (mostly triangles) in plain thin colours, so that the paper collage can shine through. The last layer for the background is a collage of spraypainted stencils. The Butterfly is on Top and the finishing layer of the painting. A very free work. I like the totaly free and spontanious, sometimes very fast and raw work like this. There is no plan or layout like in other works of mine. I have to deal with “decisions” and “happy accidents” in the words of Bob Ross. Every action leads to action, until I see and feel that no more action is needed anymore and the piece is finished.